New series. Mars is changing. Seemingly overnight the once "Red" planet is turning to gray. Something is happening, something unnatural. A team of, literally, rocket scientists figure out a way to send a probe, very fast, to Mars to determine how and why it is changing. However, when the probe is destroyed well short of the formerly red planet, it's apparent that Mars is being used as a staging ground. The only viable target for that staging ground is Earth. Ranging from rocket design to brilliant paranoids to “in your face” fighting in Iraq, Von Neumann’s War is a fast paced look at what would happen if the earth was attacked by a robot race that, quite accidentally, was bent on destroying civilization. 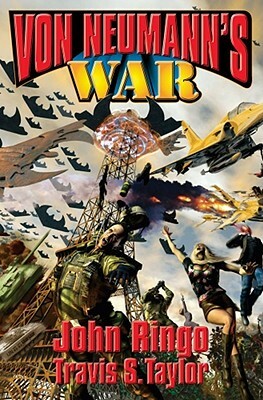 John Ringo is author of the New York Times best-selling Posleen War series which so far includes A Hymn Before Battle, Gust Front, When the Devil Dances (New York Times best seller), and Hell’s Faire (New York Times best seller), and is the hottest new science fiction writer since David Weber. A veteran of the 82nd Airborne, Ringo brings first-hand knowledge of military operations to his fiction. He had visited 23 countries and attended 14 schools by the time he graduated high school. Travis S. Taylor is the author of Warp Speed, The Quantum Connection, and One Day on Mars for Baen. He has worked on various pro-grams for the Department of Defense and NASA for the past sixteen years. He’s currently working on several advanced propulsion concepts, very large space telescopes, space-based beamed energy systems, and next generation space launch concepts. “Doc” Travis is also a black best martial artist, a private pilot, a SCUBA diver, has raced mountain bikes, competed in triathlons, and has been the lead singer and rhythm guitarist of several hard rock bands.